Marchay Founder Jon Ein made a mid summer visit to the bucolic region of Sonoma County. Here he shares his experience of wine tasting, farm to table dining, and biking in California’s “Other” Wine Valley. We focused our trip on Sonoma, the area around Healdsburg rather than Napa. 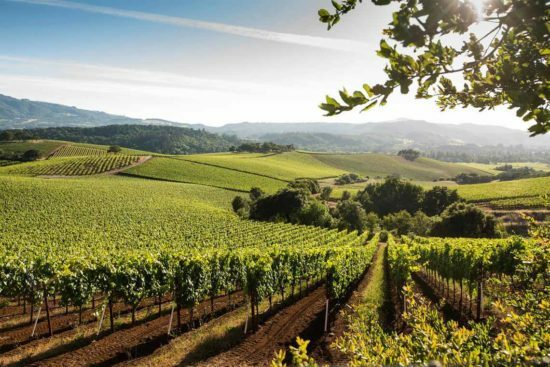 Sonoma is less precious and manicured than Napa, and not as touristy and more local. 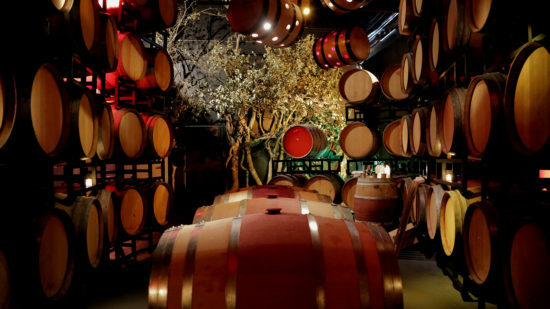 Because Sonoma is closer to the coast and therefore cooler at night, the wines are focused on Chardonnay and Pinot Noir as opposed to Napa, which is Cabernet centric. Wine tastings and vineyard visits are great because you get to hear the stories around the wine, the history and philosophy. Usually these stories are tied to a passionate founder, whose own story is connected to the region. So there’s history, business, agriculture and biography, while tasting great wine. We did spend the first day going through Napa to do some tasting before we crossed over as Calistoga to Sonoma. The first winery we visited was Raymond, a famous old estate bought by dynamic French wine scion Jean Charles Boisset. Jean Charles is a marketing visionary in addition to vintner, and believes in creating experience around the wine. At Raymond, he has created unique programs for visitors including private make your own wine sessions where you can mix your own wine from their different wine stocks, have the wine made and bottled and even design your own label. He has different tasting rooms, including a new Cabaret Room that looks exactly like the caberet at the Faena in Miami. The wine is also excellent with 12 district wines from different plots of land. This is not the Raymond you think about in a mass store. This is great juice. I recommend touring the garden before or after the tour, which grows food for the kitchen and has sample vines. Fun fact: vine roots will go up to 40 feet underground to find water. While we didn’t stay in the area; the Calistoga Ranch, an Auberge resort, off the Silverado trail is my favorite. I particularly like the town of Calistoga in the northern heart of the valley, as it’s a little more authentic than the towns further south. From Calistoga we crossed the Valley to Sonoma. 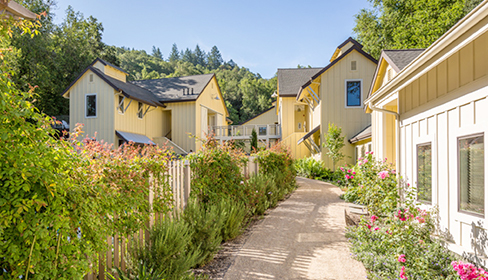 We stayed at The Farmhouse Inn which is about nine scenic miles from Healdsburg and beautifully done. A small country styled lodge with large rooms all with fireplaces and outdoor space, it has a top quality kitchen with everything sourced locally. There are nice little touches. At night guests get ingredients to make s’mores around the fire pits, and turn-down service includes addictive gluten free chocolate chip cookies and milk. An essential activity, for anyone active, is biking around the country roads and past (or to) the vineyards. Many people bike and taste along the way. The first day we rented bikes in Healdsburg and did a popular loop north, stopping for sandwiches at the Dry Creek General. Established in 1881, Dry Creek is has expertly curated home wares, gourmet goods and world class sandwiches made from in house smoked and cured meats. It’s an institution that has perfectly evolved with its community. Healdsburg is one of the most charming and sophisticated yet unpretentious small towns I have visited, including many superior places to eat. The ingredients and farms in the area are unparalleled and many top chefs have moved to the area. We went to four we recommend. First was Chalkboard, a farm to table Gastro pub style restaurant in the hotel Le Mars, run by chef Shane McAnelly. It was simple and delicious , especially the glazed, wood roasted salmon. Next Door is a beautifully executed garden and homewares store, larder, coffee bar and restaurant called Shed. We had a delicious and healthy lunch in the restaurant area, with creative organic salads and homemade teas and juices. A must. 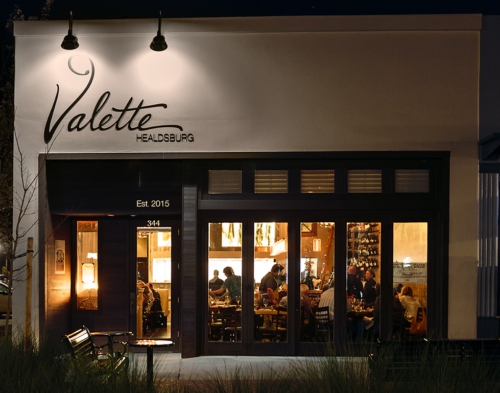 Another dinner was Valette, a simple but sophisticated restaurant owned by the Valette brothers. We had an exceptional steak, and a world class strawberry shortcake for dessert. The final night we had a tasting at Lynmar, a stunning vineyard owned by Marchay members Lynn snd Anisya Fritz. Lynmar produces highly specific Chardonnay and Pinots in their 140 acre property, with gorgeous gardens and outdoor event spaces . After the tasting we went to Barndiva, a leading farm to table restaurant housed in a repurposed barn in the center of Healdsburg. You could easily spend a week in the area, tasting, biking and eating in different delicious and creative restaurants. It’s a must visit for anyone who loves food, wine and beautiful scenery.